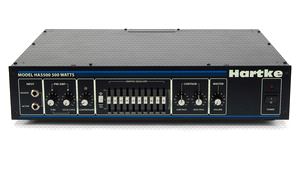 KitMonsters – Hartke HA5500c. The music makers’ guide to making music. With 500watts of power, this amp head provides enough punch for any gig. A dual preamp system allows you to select or blend both solid-state and tube circuits. With a ten-band graphic EQ and contour controls you can fully shape your tone, and with the built-in compressor you can get added punch, as well as smoothing out any variations in note volume if you wish. Handy extras include a ground lift switch, which can help prevent hum or buzz, and options for passive/active basses, as well as a balanced direct output for sending a signal to a mixing console.